Gwalia Colliery worked the 4 foot Seam. West of Llewitha and South east of Garngoch No.1 Colliery, Garngoch. were all successful, engineers & surveyors. 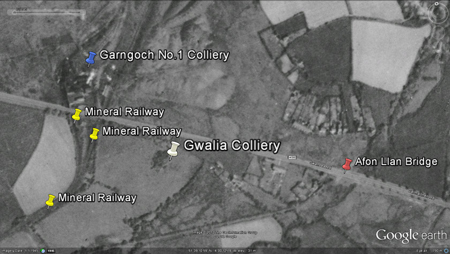 Gwalia Colliery, Google Earth 1945, right of Garngoch Mineral Railway. 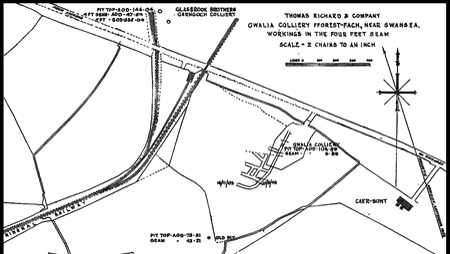 Gwalia Colliery reproduced from (1936-1947) Ordnance Survey map. Without my text and pin reference. 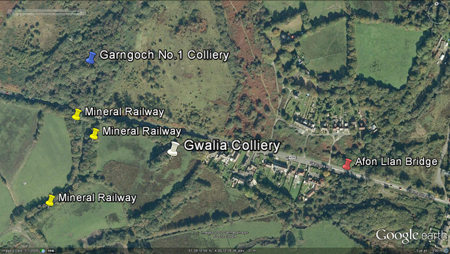 Gwalia Colliery, Google Earth 2009, right of Garngoch Mineral Railway. Meaning of "Gwalia"my interpretation, meaning "a poetic name for Wales", source: wikipedia.org/wiki/Gwalia. STORY OF SWANSEA D & V.
Sinking commenced, having to work through a bed of sand. Came in to contact with the 4 foot coal seam. Mr. T. Richard, Jnr., died (1853-1904). Afterwards the colliery was sold to Mr. David Rees of the Cape Colliery, further west where Days Garngoch is today 2012. Shows colliery with a shaft, buildings and access to the site from Swansea Road. Named colliery, site is not as detailed. No name, now old workings. "Another Company was formed by Mr. Richard, Jnr., and a colliery opened opened to work the Four-feet seam on the Caenewydd Farm land about 220 yards south-east of Garngoch No. 1 Colliery managed by the Glasbrook Brothers. The Company shareholders were: W.W. Jeremiah, chairman; Thomas Richard, managing director; Evan Jones, secretary; John Richard; Catherine Jeremiah and Elizabeth Davies." "Gwalia" was used to filter the Cambrian index as best as possible with the information available.